My Enjoy Philippines privilege card has become a necessity for me and my family. Each card comes with a fat booklet that includes hundreds of tear away coupons which help you save over P300,000!!! Coupons include great deals on shopping, free hotel stays and a multitude of restaurant freebies including appetizers, wine and sometimes even entrees. But by far my most favorite of all are the buy one take one main course coupons. What's makes my Enjoy Card even more indispensable to me is the diversity of their partner establishments. You will find most of your favorite places for casual dining like Pepper Lunch with unbelievable deals which make affordable even more affordable. Imagine treating your family out to lunch for less than P500, how can you beat that?? For special occasions and dinner dates, the list is endless. Most fine dining establishments in the Metro are Enjoy partners. Discounts vary from 50% off, complimentary bottles of wine and buy one take one on all entrees. ...And this is why I am super excited that I was chosen to host an Enjoy Privilege Card giveaway for you guys!!! 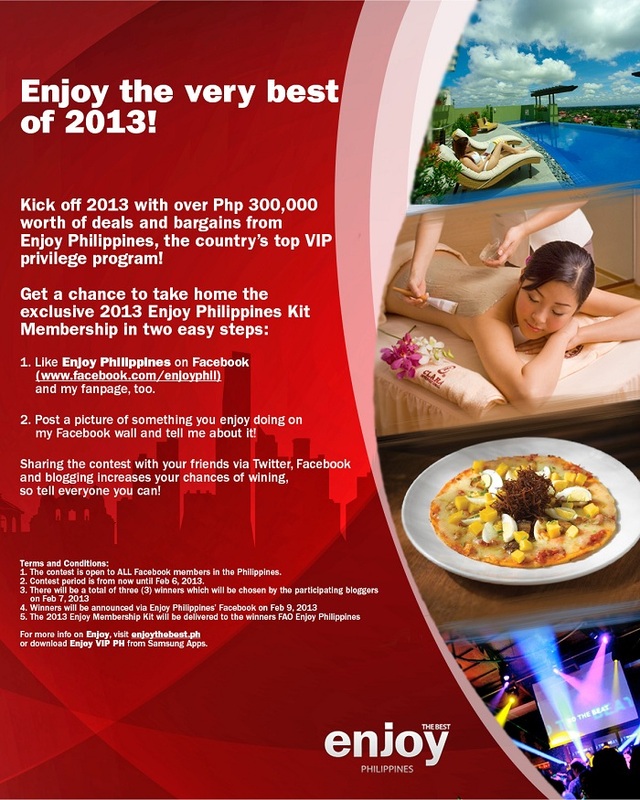 Three (3) lucky readers will win for themselves a 2013 Enjoy Philippines kit worth P1995 which includes a personalized membership card and coupon booklet wrapped inside a pretty red tin box! LIKE Enjoy Philippines and Ms Eggplants Chronicles on Facebook. Post a photo of something you enjoy doing on my fanpage wall and share the link for this giveaway with your friends. Leave a comment on this post with your name, email address, GFC name and the facebook URL of your photo with giveaway link. Follow me on twitter and tweet about this giveaway. Please leave a second comment for this option for an extra entry. 3 winners will be chosen via random.org and announced on this blog at the end of the contest. facebook URL of your photo with giveaway link. this is awesome giveaway Ms. Sar!this is perfectly for this upcoming summer.joined. facebook URL of my photo with giveaway link.